My wife had made plans to have lunch on Saturday with a friend who lives in the Washington Ave area which was the perfect excuse for me to visit the nearby Broken Spoke Cafe after dropping her off. Roy de la Garza, the owner of the Broken Spoken Cafe, stopped by the table to say hi and I took that opportunity to ask him about the various styles of mussels on the menu. I typically just have the traditional style which is steamed and served in a white wine broth, but I wanted to try something new. He explained the different sauces and highly recommended La Moule Roquefort which is mussels with a creamy blue cheese sauce. I am a fan of blue cheese, so I ordered some up with a bowl of the frites and a Chimay White on tap. The mussels were served on the half-shell on a plate and covered with the cheese sauce which is very different from the traditional style of a big pot of mussels in the whole shells soaking in a broth. The mussels were large and meaty and the blue cheese was not overpowering and still let the flavours of the mussels come through. 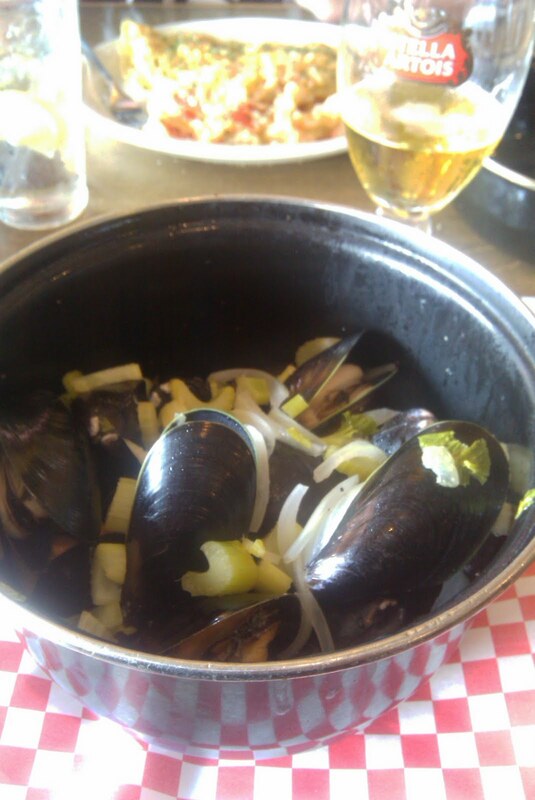 I used the frites to clean up the extra sauce from the shells and contemplated just licking them clean. The frites are too good to leave any behind, so I slowly snacked on them after the mussels were gone while sipping on a Kwak (served in the funky traditional glass). The beer selection looks like it may have increased since my last visit and they're a good example of a restaurant that understands the benefits of offering good beer. The beer is all served in the proper glassware and the servers are all knowledgeable about the beers they offer.